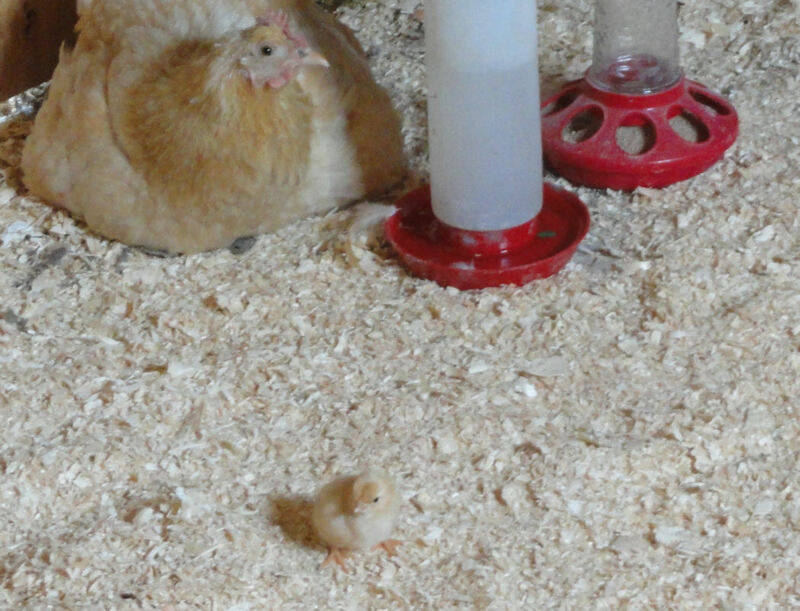 The good thing about letting a broody hen do the job of caring for a new batch of chicks is that you don't need to worry about using heat lamps to keep the chicks warm - they just snuggle up underneath the hen's wings when they're cold. All that obsessive checking on them that happens when you have an artificial set-up (are they too hot, too cold?) just isn't necessary. The downside is that in the early days (when, let's face it, they're at their most cute) you don't actually get to see the chicks very often! If you don't mind my asking, what do you have on the floor underneath the hen and chicks. I can't identify it in the picture. In the past we've just put down newspapers but this year we're using shredded newspaper. The chicks are loving it but it gets into the water and the food dishes, making me crazy. It's wood shavings - but it gets in the food and water too - they love scratching it up!